You probably know that to get a building heritage listed, the Heritage Council (aka the Style Council) has to give reasons why it should go on the list. You can find these on the Style Council’s website. 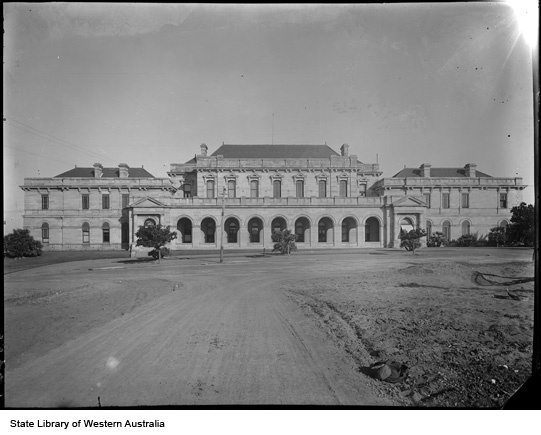 The 1904 section of the building expresses the sense of grandeur and pride associated with the establishment of Parliament House & Grounds, through both the external and internal design, finishes and furnishings and by the use of Western Australian building materials. To summarise: According to the Style Council, when it opened people loved Parliament House. Mr J. M. Kelly wasn’t too concerned about the poor. He was just concerned about the poor design, which he called a “blot on the landscape”. I have come to the conclusion that the new Parliament Houses being erected are mean, paltry, and but a sorry housing for the legislators of Western Australia. On its western side, past which a fine broad road leads you, it has an almost despicable appearance, reminding one of a railway goods shed, with its squat, stuccoed walls. Okay, but somebody must have liked the design. Perhaps legendary architect George Temple Poole? It is fair to deduce that the State is on the eve of expending £210,000 for a building of the class of construction and work generally which cannot be considered sufficient for the monumental character of a State Parliament House. The proposed building has no pretensions whatever to architectural effect in any sense of the term. Judging from the plans and elevations offered for inspection the ‘tout ensemble’ discloses a lop-sided pile of buildings of the most incongruous nondescript order of the cheap and nasty type. But dear reader, you’ve probably noticed that we’ve been unfair. All of these criticisms were made before Parliament House opened. Once it was open, surely the “sense of grandeur and pride” (as the Style Council puts it) will become clear to the people of Perth. The visitors had time to criticise the extraordinary colour scheme of the Assembly Chamber, count the hundreds of black swans swimming the blue sea of carpet, comment on the dizzy height of the galleries, and draw comparisons—born of the wearying display of stained glass and coloured wood—between the general appearance of the Chamber and that of a glorified saloon. A ‘glorified saloon’ is more generous than ‘cheap and nasty’ pile of buildings. But not much. And certainly not what you might expect from the Style Council’s glowing description of the external and internal design. Just because it’s on the State Register doesn’t mean anyone liked it at the time. Proposed Parliament House. Not built.